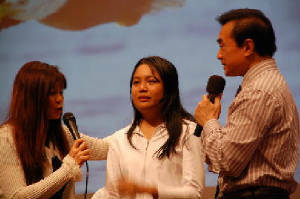 The Elijah Challenge is an effective ministry launched by Pastor William Lau and his wife, Pastor Lucille. Sister Grace and I have been blessed to be able to attend their seminar and healing rally in 2005 and 2006. Ever since then, God has blessed our ministry with signs and wonders. Sick people were being healed miraculously after being prayed for by ordinary disciples of Christ. 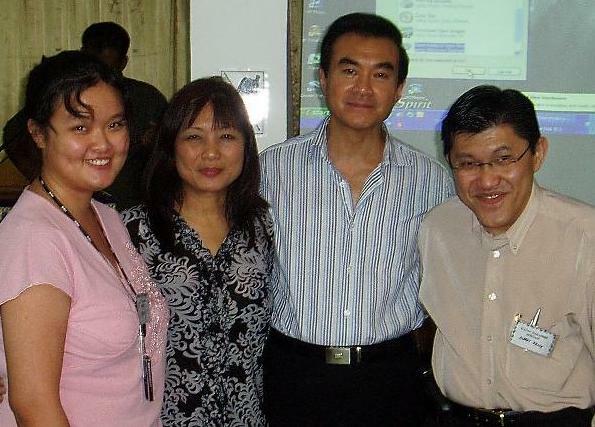 Pastor William and Pastor Lucille Lau (center) with Sister Grace and Pastor Albert Kang. * This model is based on John 14:12. 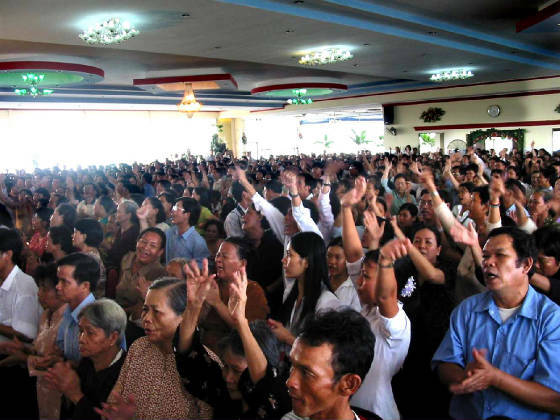 "Ordinary" disciples of Christ are empowered to preach the gospel and minister miraculous healing in low-budget, low-profile, relatively small (or even one-on-one) meetings. When the listeners see the miracles and listen to the gospel, their hearts will be open to accepting Christ. * The new believers will be followed up by the believing friend, family member, neighbor, or business associate. Such personal follow-up of new believers is more effective than the impersonal follow-up after large mass crusades. There is a far greater likelihood that the new believer will join the church and be discipled for Jesus Christ. * This is the original kind of evangelism because it involves signs and wonders in Jesus' name. This unique demonstration of the Holy Spirit is manifested through the ordinary Christians. It does not depend on the presence of specially gifted ministers. As such, evangelism of this kind can be an ongoing and continuous feature of the life of every local church. * You do not need to be a Charismatic or Pentecostal to exercise this authority to heal. Strictly speaking, this is not a gift of the Holy Spirit but the mandate of Jesus Christ. You do not need to become highly emotional to use this authority. Thus both Conservative Evangelical Christians as well as Charismatic/Pentecostal believers are able to work hand-in-hand in the same ministry.